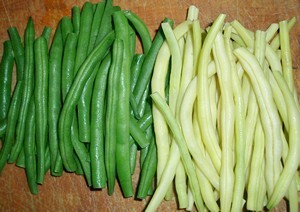 The Accidental Locavore thinks there’s a lot you can do with green beans once they’ve been blanched. It’s a good idea to prepare an ice bath for them before you start. Just fill a big bowl with ice cubes and water. Heat the oil in a sauté pan over medium-high heat. When the oil is hot add the cumin, mustard and sesame seeds. As soon as the seeds start popping (which will be almost immediately) add the beans, stir and lower the heat to medium-low. Add the salt and cayenne and stir for about a minute. Serve and enjoy. Heat the butter in a sauté pan over medium heat. Add the beans and cook until warmed through about 4 minutes. Squeeze the lime over the beans and garnish with the sesame seeds. Serve and enjoy. Heat the butter in a sauté pan over medium heat. Add the beans and pine nuts and cook until warmed through about 4 minutes. Serve and enjoy. For years, my friends and family knew only three ways to deal with those poor, neglected green beans: eat them raw, boil them to death with bacon (ugh) or make a cassarole with Campell’s Mushroon soup (ugh twice). It’s nice to see someone stepping out of the bean box….lightly sauteeing them in olive oil and garlic with lots of black pepper doesn’t hurt, either.